The opening of Roger & Me was a few days away when we sat down to talk with its maker (his detractors might say perpetrator), Michael Moore. We were the last of 14 interviews Moore had held that day, but the filmmaker wasn't winded. For by this time, such pressure was par for the course with what had begun as a film and become a phenomenon. Picked by the Los Angeles Film Critics Association as the Best Documentary of 1989, this mordantly funny piece of investigative journalism centers on the the near-total economic collapse of Moore's hometown Flint, Michigan, in the 1980's after General Motors closed its once-thriving auto pla n ts laying off 35,000 workers, moved its auto operations to Mexico, and entered the armaments industry. Narrated by and starring Moore, Roger & Me recounts his (unsuccessful) efforts to get GM president Roger Smith to come to Flint and see the havoc his company's exit had wrought. Moore's film is a sardonic send-up of a serious subject, an approach that undermines some cherished notions about the socially aware documentary. Far closer to Orson Welles' F For Fake than Marcel Ophuls' The Sorrow and the Pity, Roger & Me revels in a rhetorical playfulness whose roots are in the stories of George Ade, and whose branches are the Pete Smith "specialties" and the deadpan satirical assemblages of Bruce Conner. Shot in 16mm with a minescule crew, its funding partially coming from church bingo games and Moore's selling his own home, Roger & Me is classic degree zero filmmaking. 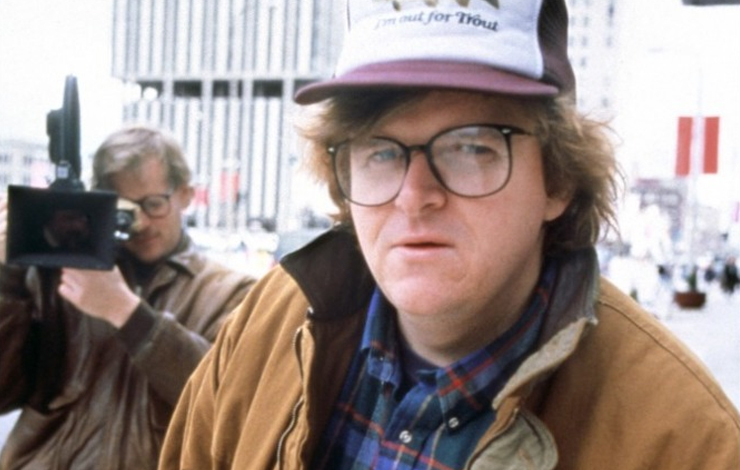 As Moore has stated elsewhere, "I didn't want to make another 'dying steel­ town' documentary with all the cliches about how horrible it is to be unemployed. I think everyone knows it's rough to be without money, so I decided that this film would not have a single shot of an unemployment line. I wanted images you don't see on the six o'clock news." Yet unlike the scores of similarly low-budgeted documentary films that are made every year, it has commanded unprecedented attention. Advance critical raves from both the trade press and Siske! and Ebert, and wildfire word-of-mouth following successful screenings at the Toronto, Telluride, and New York film festivals, had led to its pickup by a major studio—Warner Bros.—and a nationwide release. "One of the reasons Warners Brothers finally got the film," Moore explained, "was because they were the only studio that wasn't pushing the three picture deal, which I guess maybe other people would have jumped at but I didn't want. I didn't make this film so I could make another film. I wanted the companies to want Roger and Me, but most of them wanted me. They think I've got some screwball comedy in me that's going to make a hundred million dollars. Or as one studio executive told me, 'We just KNOW Spike [Lee] has that comedy in him.' "
To hear it from Moore, this ex­ journalist didn't know he had Roger & Me in him either. "I'd never made a film before and the idea for doing it came to me after I was fired as executive editor of Mother Jones magazine in 1986. I was really messed up. I was in bad shape. I couldn't get out of bed for a week. I didn't know what I wanted to do. I was living in San Francisco. I'd given up my newspaper in Michigan [the Flint Voice, later the Michigan Voice], so I decided to go to a lot of movies. Just theatre hop, going to three movies in a row." During his moviegoing blitz Moore saw many of the documentaries he now claims as favorites, including Hearts and Minds, Harlan County, USA, Atomic Cafe, Who Killed Vincent Chin?, Sherman's March and others. Significantly, all are political in nature. Most of the other films he saw, how­ever, didn't impress him very much. "After awhile I just thought, hey, maybe I should make one. Seriously. I said to myself most of these aren't very good. I was going to see everything except the ninjas and the Neil Simons—the only two genres I couldn 't handle. But I didn't know what I would do. Then I went back to Michigan a couple of weeks later and Roger Smith came on the tube and announced he was going to lay off another ten thousand people. He'd been laying off people throughout the 80's. And I just thought—well, that's the film. I wrote down an outline that night and called it 'Roger & Me: A Humorous Look at How General Motors Destroyed Flint Michigan.' "
Moore didn't have to look too far I or too close to find examples of the town's destruction. In the wake of the firings, Flint had become a major U.S. crime capitol. The layoffs resulted in widespread evictions (Deputy sheriff Fred Ross, the town's chief evictor, is one of the film's main characters), and citizens had taken to everything from I working for "Amway," to raising rabbits (for "Pets or Meat" reads the sign on an enterprising young woman's door) in order to survive. The town fathers meanwhile, rather than dealing with the problem squarely, had taken to importing show business and polit­ical figures (Ronald Reagan, Pat Boone, Anita Bryant) to give "uplifting" talks, and investing money in a luxury hotel, a shopping center, and an amusement park in a harebrained attempt to turn a dying city into a tourist attraction. Moore shows it all with remorseless, scathing wit. Say what you will about Moore's picaresque lampoon (and people have been saying quite a lot) the one thing that can't be denied is that it's the only kind of work imaginable dealing with this subject matter coming from a member of an old line union family. For, nearly every member of the filmmaker's kith and kin, as far back as Moore can recall was employed by GM, including an uncle who took part in the Great Flint Sit Down Strike of 1937 which resulted in the founding of the United Auto Workers. "What you see there on the screen is pretty much me," Moore said. "I look like that, I wear those clothes. That's my hat. I'm not too much different from what you see there." Moore's detractors, however, saw a lot more than a man in a baseball cap holding a microphone—and they didn't like it. Two days before our interview, the film had made the front page of the Wall Street Journal in an article about GM's allegedly dire financial straits. "That's a matter of opinion," observed Moore who noted that, "They made five billion dollars last year, more than any company has ever made in the history of the United States of America. I wouldn't lose too much sleep over that. Cars sales are in a slump right now, but that's a cycle that goes on." "It's really funny," Moore continued, "here's this article about the global economy and somehow Roger & Me has figured into the toppling of GM!" He also revelled in the unintentional irony of the Journal article deeming his film "brilliant" and on the other hand, "incredibly unfair." But the Journal was nothing compared to the flap resulting from an interview with Moore conducted by Harlan Jacobson in Film Comment which had just hit the stands. Jacobson excoriated Moore for not arranging the events the film depicts chronologically, and allegedly fudging facts. So put-out was Jacobson by Roger that he went so far as to invoke the U.S. government's fabrication of the so­ called "Gulf of Tonkin incident " (the official "inciting" incident for the U.S. invasion of Vietnam), as a point of comparison with Moore's techniques. "I make no pretense about being chronological," Moore said in his defense. "I don't put dates in. When you guys write this article, are you to write it in exact chronological order? This little event? No, you 're going to order it in a way that makes sense. You're going to cut and paste. You can't misquote me. You have to tell the facts correctly. And the facts have to have context. Those are the three rules. Beyond that, you have license as journalists to order the story in a way that's going to be coherent and interesting to read. I have the license as a journalist and as a filmmaker. There's not a single fact in the movie that's not true. Every fact has a context. For instance, [televangelist Robert) Schuller came as a response to the lay offs. Now do you really care that he care that he came as a response to the Chevy V-6 engine plant closing or the Chevy pickup truck plant closing? If it makes you feel that much better knowing, then I apologize to you the viewer for not making that really clear." "He (Jacobson) has a right to print anything he wants," Moore continued, "his opinion and whatever. But what he did in that interview, I felt, was very dishonest. He didn't print the whole discussion that we had. The very thing he was accusing me of." Moore has himself been accused of mean-spiritedness, by other critics, in dealing with Flint's problems. The filmmaker rebukes such charges. "We filmed permissions with about eighty per cent of people in the film. We asked them on camera to use this on any form, in any media. They said 'Yes.' We figured public figures were fair game." As for the Rabbit Lady, Moore claims her frequent appearance in the film is entirely metaphorical. "Pets or meat. That's the town. Either you're working or you're meat. That's GM's attitudes toward its serfs. The clubbing and skinning of the rabbit stands for the violence. Why aren't people upset by the violence of a black man getting shot two minutes later in the film? Why are there walk­ outs during the rabbit section, but not during the shooting? That's the image they're used to, but they eat their meat every night." Happily, offscreen, there's an upbeat resolution to one area of the film's concerns. For as part of Moore's agreement with Warner Bros., the company is buying homes for the families whose evictions are seen in the film. Warner Bros. is also distributing large blocks of free Roger & Me tickets to the unemployed and the homeless. "And I'm paying the rabbit lady's tuition to veterinarian school," said Moore, "and there's another lady who was present at one of the evictions that I'm... But I don't want to say what I'm doing. I'm giving a lot of the money away." Other future plans include, "maybe a film about Vietnam where this time the Vietnamese win." Moore laughs sardonically. "Oh, I guess they did, didn't they? A film about apartheid that for the first fifteen minutes looks like it's taking place in South Africa and then the camera slowly starts to pull back and you find that you're in Detroit." This would place Moore directly on a number of firing lines. But he's been there before—with his camera and without. "I was always very scared," he admitted, "always expected to be arrested. And especially at that Christmas party." Referring to the film's penultimate sequence where he finally faces Roger Smith, who is addressing an assembly of GM staffers at a Christmas gathering, Moore notes "You can't really see what's happening from the way it's framed." Recently he's had other fears—from the limousines Warner Bros. has provided for him for publicizing Roger. "I've had to tell them,'Stop send­ ing me these limousines!' Great, here I am driving around in this limo and all of a sudden the revolution begins while I'm inside, and they haul me out of the car and I'm screaming 'Warner Bros. made me ride in this!' and no one believes me." Another thing few believe—that Moore was prepared to deal with Roger Smith if, for some reason, the GM executive agreed to go back to Flint with him. "I was ready," Moore insisted. "If he was smart, if he was a Lee Iacocca or an H. Ross Perot he might call my bluff. We were going to put him in a Ford Econoline van, tol him around town, take him to an eviction, and take him to the bunny slaughter, have his colors done (by the "Amway" representative.) Or if he wouldn't do any of that, we'd still tool around and we'd have this hour-and-a-half conversation in the van between Roger and Me as he viewed the crumbling American empire. I pictured this as sort of My Dinner With Andre on wheels." Moore knew that "there was just a slim chance of that, but I honestly did think he'd give us five minutes. If he had smart P.R. people, they would probably have told him, 'Get it over with ', but he wouldn't even do that. I felt it was like the end of The Wizard Of Oz where they were on the quest for the big bad wizard, this frightening wizard, and suddenly little Toto pulls back the curtain and it's just this little runt of a man, shouting 'Pay no attention to the man behind the curtain.' That's just what America wants us to do. Pay no attention to the man behind the curtain." David Ehrenstein was recently fired by Daily Variety. Bill Reed is looking for work.